In 1976 I was making multi projector slide presentations with a couple of other guys. The kind of thing you would see at Expo 67 or the 1970’s Ontario Place, if you are old enough to catch the reference. We called ourselves the Awes Studio, and we were based in London Ontario. We specialized in shows about culture or art, and created works that were an artform in their own right. There was not nearly as much money in this area as there was in creating commercial industrial or business presentations, but it was a lot more fun, and we were creating a lot of work. So it came to pass that in 1976 we pitched Ontario Place on the idea of creating a multi-screen slide/ sound spectacular of Anishinaabe artist, Norval Morrisseau’s interpretation of the Ojibway legend of The Man who changed into a Thunderbird. After a bizarre late night meeting in the executive board room of Ontario Place which I will save the telling of for another time, we had a go-ahead and some development money, so the first thing we wanted to do was to contact Mr. Morrisseau and run the idea by him, hopefully for his blessing and in the best case scenario his involvement. At this point Morrisseau was out of the public eye and reportedly living on the street in Northern Ontario somewhere. It didn’t look good, but we started the process. The one thing we knew was that he had been represented since the beginning of his artistic career in 1962 by legendary Yorkville gallery owner Jack Pollack, and although Mr. Pollack was by this point very ill and reportedly about to close his gallery, we contacted him anyway with the hope of a meeting. He agreed, and what a lovely person he was. 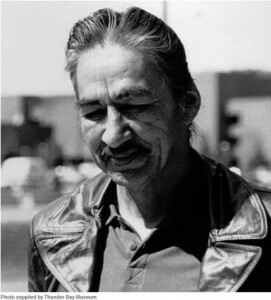 He made us feel most welcome, listened to our story, and suggested that although he did not know where Norval was, and could not guess what his response may be, he would do his best to contact Mr. Morrisseau and set up a meeting. 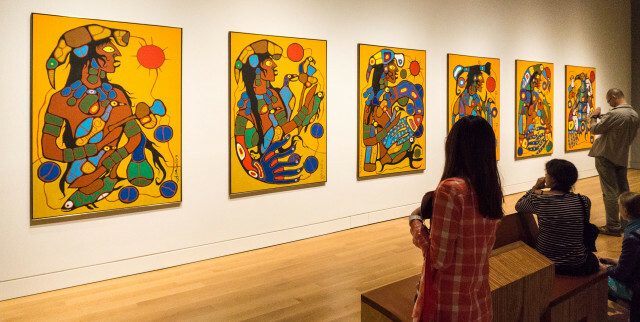 He had family contacts that he could send a message through, but he was quite concerned that no one had seen Morrisseau in quite a while and that reports suggested he was not doing well. We crossed our fingers and waited. We set about contacting various native organizations for input and approval. People didn’t think about Cultural appropriation in those days, but we were serious and committed to the idea of employing as many Native artists as possible, and of studying the story and consulting until we felt certain we were presenting it as accurate and sympathetically as possible. It quickly became tough sledding as we came to discover that there was a vast difference in the opinions of the many scholars contacted. We learned that Norval Morrisseau had received quite a bit of condemnation within the Native community itself for his telling of the story in book form. Many believed that it was only to be passed on verbally and within the tribe. The more we consulted, and learned the harder it became to see our way forward . To find a spiritual core to hang on to, and build from. It was all looking rather bleak when we got a call from Jack Pollack that Norval Morrisseau had been found, and very surprisingly to all of us, he had agreed to come into Toronto for a meeting to hear what we had to say. We were equal parts ecstatic, and apprehensive. What if he rejected us totally? On the other hand we held great hope he may co-operate in the fact that he agreed to meet us. 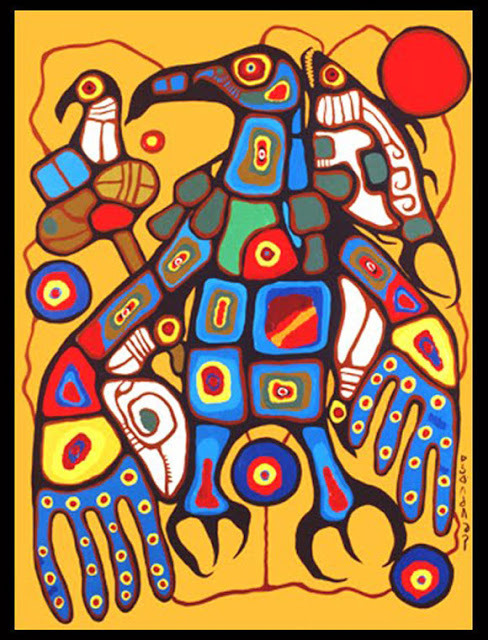 We told Jack Pollack before the meeting that we would describe the project to him, and then ask Mr. Morrisseau if he would be willing to paint six large panels to depict the stages of the man turning into Thunderbird. We would then photograph the works and use them in the production as the main, integral “sign posts” in the progress of the story. We would also ask him if for the duration of the show, we could display the paintings along the long corridor leading to the theatre because as the line was usually quite long, and slow people would have time to contemplate them as they waited to move forward. Mr. Pollack suggested that if Norval agreed to go ahead, he would rent him a studio for a period of months and provide him with the stretched canvas’, a budget, and the supplies necessary to produce the works. We weren’t even commissioning him. He would own the paintings. There would be money for allowing us to use them of course, but we were basically just asking for him to create them, and allow us use them for this purpose. Preposterous when I think about it now. All we could offer other than the money was that thousands from all over Ontario and beyond would see them, and a faithful depiction of the story he told in his book. The date for a meeting was set for a cold February Wednesday at eleven o’clock, at the jack Pollack Gallery. My work mate, and friend Ford Evans and I piled in my old Volvo and made it through blizzard conditions on the 401 from London to Toronto with only moments to spare before the arranged meeting. We had to park a few blocks away because of the snow. Time was running short so when we arrived at the gallery we burst in all red faced from the fast walking and strong wind; with our, as it was at the time, long hair blown every which way, and snot frozen to our facial hair. And the kicker was, that as it happened we were both wearing full length antique fur coats. Mine was racoon, and Ford was wearing his grandfather’s buffalo coat. Good, practical garb for February. We never considered any implications. So we burst into the heat of the gallery space and there before us stood Jack, whom we knew, and the great man himself. 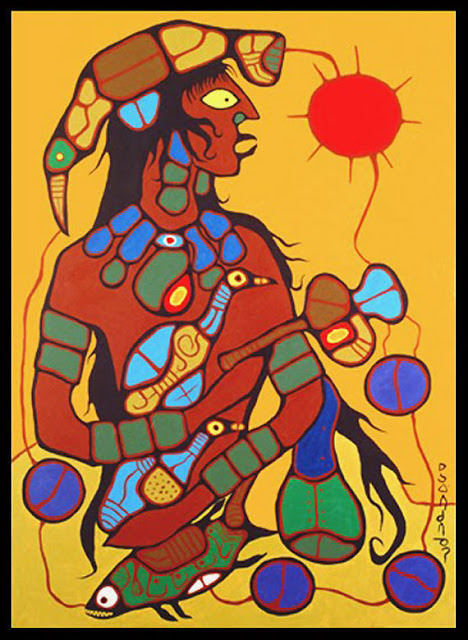 The great Anishinaabe artist, sometimes known as the Picasso of the North, Norval Morrisseau. Or as he signed his paintings and called himself. Copper Thunderbird. Long haired, and bearded with a clear gaze and knowing face. You could feel his greatness. He was very still. We gathered ourselves up and approached with hand’s extended to give and receive a traditional hand shake. “Mr. Morrisseau, we can’t tell you how honored and happy we are to meet you, and we are so grateful that….” He held up his hand in a stop gesture. Looked right at us, and said “wait a minute, I’m talking to your coat.” We paused. He waited for another moment, then he closed his eyes for a moment, and then finally said, “ O.K. I’m pleased to meet you. I’m here. So what is it that you ask of me. We looked over at Jack who just smiled and looked away. There was nothing left to do but lay it out as plainly and directly as possible so we did so in about a three minute rap leaving out many of the details and just portraying to the best of our abilities our passion and devotion to the story, and our desire to produce it for a large public. We got to “and so, that’s about it in a nutshell but we imagine that you may have a lot of questions.” Long silence. He just looked at us. We began to feel he was looking through us. We all stood there in silence for what seemed another eternity, when suddenly he said brightly “ O.K. I’ll do it. And that was the last I ever heard from or saw Norval Morrisseau or Jack Pollack. Jack died not long afterwards, and the “thunderbird project’, although innocent of any wrong doing got caught up in a very large scandal that wiped out many departments and projects of Ontario Place. You might remember it from the papers. It was a big deal. People went to jail. But for us it was just sad that the project died on the table, and there was nothing to do but move on to other projects. About four years later I picked up a copy of MacLean’s and low and behold, there are on the cover is a photograph of the six panels by Norval Morriseau entitled “Man changing into a Thunderbird” It was on the cover because it had sold to the Esso oil collection for some huge amount of money. A few years after that, I walked into the Art gallery of Ontario, turned a corner and there they were in the flesh. Magnificent. I sat down and looked at them in awe. I was incredibly moved. Not only did he do what he said he would do, but in doing so he had created a masterpiece. I can only hope that Jack lived long enough to see their completion. When I think back I am truly grateful for my brief, but brilliant moment with Norval Morrisseau, and it makes me feel good to have been even a tiny part of the story of the creation of such a magnificent and important work of art. I never did figure out what he was saying to my coat.